It is with a profound sadness but also with an immense pride of her life well lived, that our family must announce the passing of Joyce Aline Murphy Dundee. Joyce passed on Wednesday, February 20, 2019 at UTMB. She was 94 years of age and would have celebrated her 95th birthday June 19th. She is predeceased by her mother, Eddie Mae Jones Murphy and siblings: Nell Murphy, Velda Murphy Pakalns, Helen Murphy Thames, Sammye Murphy Hope and Donald Murphy. Joyce is survived by her sister Teresa Bruce Uhlig (Bill) of Huntsville, Texas as well as a host of nieces and nephews from her side of the family as well as from the family of her former husband, George H. Dundee, deceased, of Galveston, Texas. Joyce leaves behind children, grandchildren and great grandchildren: Daughter Patricia Dundee Hughes (Peter) of Ocean City, MD., Son John K. Dundee (Becky) of Galveston, TX., Grandson George “Ben” Dundee (Bryanne) of Austin, TX., Jennifer Dundee Reeder (J. Patrick) of Georgetown, TX. Great Grandchildren Solomon “Solo” Emmitt Dundee and Nora Esther “Birdie” Dundee of Austin, TX. To say Joyce was a strong, determined and fiercely independent woman would be an understatement. She rose from the most austere childhood that could be imagined. She was the daughter of a single working mother who had been abandoned by her husband as The Great Depression began to affect life in the Piney Woods of East Texas. As the oldest, Joyce took charge of the family while her mother worked multiple jobs to survive. Joyce taught her siblings to read, write and to spell correctly, grading their homework before submission. Her sister Velda once told us that Joyce never had a toy, not even a doll to play with as a child. She found a doll that was discarded by someone, cleaned it and gave it to her younger sister. And this would be a central part of her existence as she matured: her love and care of family first and before herself! Joyce’s other lesson was her work ethic and her insistence that a person must remain loyal to those for whom they work. She spent 64 years as an employee of National Hotel Company which later became Gal Tex Hotel Corporation and the 1859 Historic Hotel Company. To literally her dying day, she would tell everyone of her affection, respect and admiration of the Moody family of Galveston. The family would bestow many gifts upon Joyce over the years, but the gifts she treasured most were the pictures of the Moody children and their families she would receive each Christmas. Over the years, Joyce had many friendships, all of whom she dearly treasured. It took her years to overcome the sadness of losing Maureen “Kewpie” Gaido and husband MJ Gaido, Sr. She consoled herself by counting as her own children the members of the Gaido family. They, in turn, honored Joyce with their love and friendship. Joyce would only dine at Gaido’s restaurant, hoping Maria was there to assist her. Above and beyond any other relationship Joyce enjoyed during her business career, none would surpass the respect, admiration and love she had for Gene Lucas and his wife Betty, now departed. Joyce and Gene Lucas were a formidable team and accomplished so many goals, space does not permit the retelling. Suffice to say, their combined knowledge of the hotel industry encompasses more than 125 years of experience! A special place in Joyce’s heart was reserved for her daughter in law Becky Dundee. Becky was Joyce’s best friend as she faced retirement, and lived with Becky and John prior to her move to the Meridian. 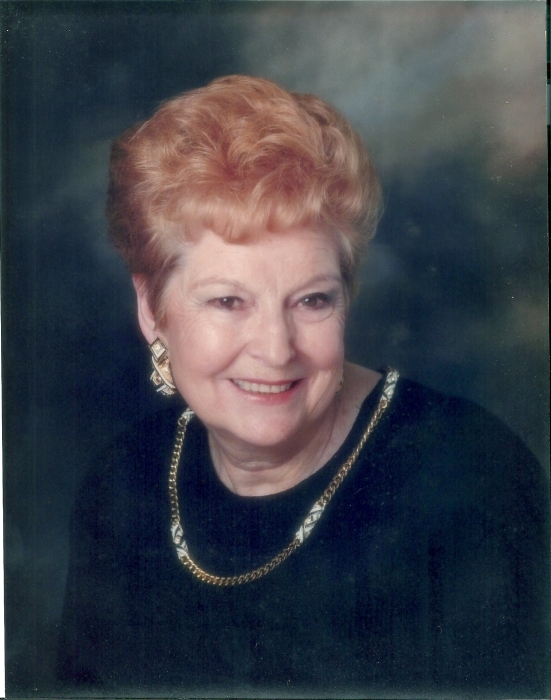 Becky, a real estate agent, often took Joyce with her to show houses or to meet clients. Joyce also counted as her own the children of her sister and brother in law Margaret and Al “Bubba” Doherty. While her former husband George was overseas in World War II, she lived with the Dohertys and honored the special bond she had established with the Doherty children for the remainder of her life. As she aged, Joyce established new relationships and truly loved the staff and guests at Libbie’s Place. She looked forward every day to her visit there, and all of the Dundee family is so very thankful for this wonderful organization! Joyce enjoyed her apartment at The Meridian, and the freedom it allowed her. The staff of Meridian has also earned a special place of gratitude from our family! Joyce’s final time with us could not have been as productive nor as rewarding without the aid of her attendants, especially dear family friend Rosemary Lopez. Rosemary considered Joyce as her “Grandma Joyce” and it showed in the manner in which she cared for Joyce. Doris Kostelecky took great care to create art employing pictures of Joyce’s family which brought her much joy. Vanessa Lopez, Annette Homer, Malea Harvey, Martha Gonzalez and Angelina Banda will be forever in our family’s prayers for their patience and kind treatment of Joyce! A Memorial Mass will be held on Monday, March 4, 2019 at 12 Noon at St. Patrick Catholic Church in Galveston, with Father Bill Bartniski officiating and dear family friend Deacon Douglas Matthews assisting. The family will be receiving friends prior to the Mass beginning at 10:00 A.M. If anyone would like to make a donation in honor of Joyce, please consider Libbie’s Place. There are many seniors in Galveston who benefit from the programs and caring attention Libbie’s provides. Joyce left this life in the manner her daughter in law Becky Dundee assured her she would: having had a glass of Chardonnay and with her hair coiffed in the correct shade of red. As family friend Jimmy Kessler stated so correctly: May her memory be forever blessed.